Transocean moves $1 billion to stockholders. Senate Committee questions liability provisions in the law. Mr. Thomas Perrelli, Esq. 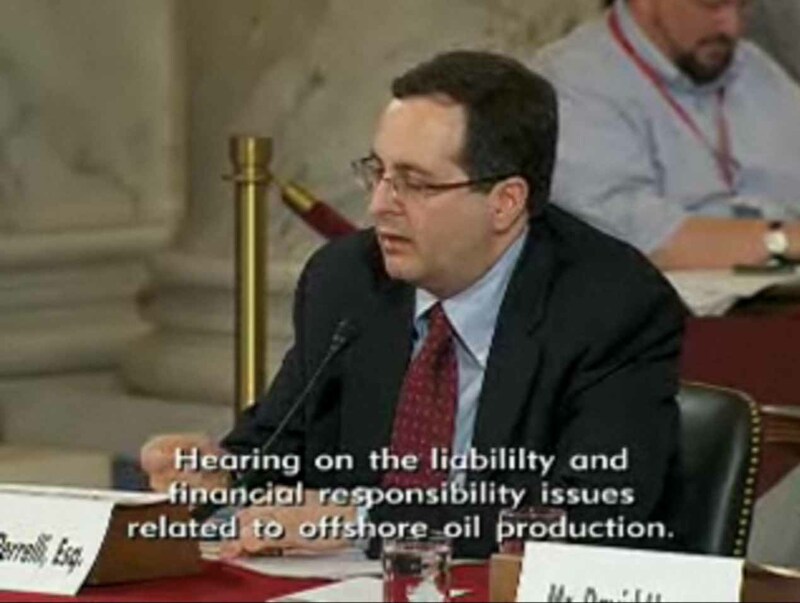 - Associate Attorney General, testifies at the May 25, 2010 Senate Committee on Energy and Natural Resources on a number of issues, including what can be done about Transocean’s moves which seem to be aimed at ensuring that their liability is at a maximum $26 million. Today at the Senate Committee on Energy and Natural Resources, responding to questions from Senator Widen, DOJ representatives, Mr. Thomas Perrelli, Esq., Associate Attorney General, said “We will be saying in the strongest way that what Transocean is trying to do [in Admiralty court to limit its liability to some 26 million under provisions of an admiralty court] is improper.” This references an early move in court in Texas, which has now been followed up by a move at a closed door meeting in Switzerland in which Transocean leadership decided to move $1 billion in Transocean corporate assets to their shareholders. How much of this was to stop a drop in stock price, and how much was to limit Transocean’s appeal as a target for lawsuits is unclear. It was noted a few times at the beginning of the hearing that while there may be federal limits on liability that can be assessed to companies responsible to the spill, there are possibly no limits on claims based on lawsuits brought through state courts. Perhaps the threat to corporate profits from non-federal lawsuits are real. But then again maybe when Senator Murkowski (R-AK) suggested that state laws would be able to pick up any shortfalls in a federal legal system she was off base, for lawsuits, whether likely to be ultimately legitimate and successful in courts or not, at times follow a route to those entities with cash on hand. Transocean’s recent moves might not be supporting Murkowski’s statement, even though on the surface it does seem that they fear claims coming from some source. Is Transocean reducing its cash holdings to make them less appealing to legitimate, or only to spurious lawsuits? While there is no clear smoking gun, no corporate strategy memo that has been uncovered that explains their motivation, one would not need to be a conspiracy theorist to reasonably assume that Transocean has a tangible fear that they are likely to be found to be at fault in at least some portion of the Deepwater Horizon spill. If legislation passes that retroactively alters or eliminates the $75 million liability cap, and that law is upheld in the courts as DOJ believes it would be, Transocean’s recent moves may prove to be prudent by a company who is clearly working to avoid liability or at least to avoid paying claims. Whether prudent moves are also ethical corporate behavior remains to be determined.